Here at Adelaide City Dental Care we are excited about World Oral Health Day on 20th March 2018. 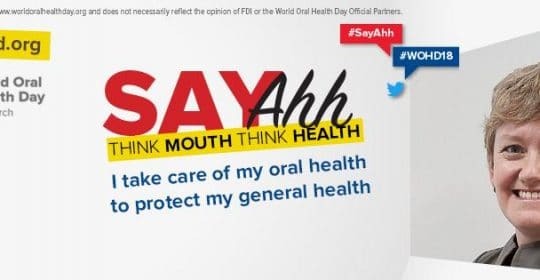 The theme is “A healthy mouth and a healthy body go hand in hand” and we know there is such a close association between our oral health and our general health. The impact the health of one has on the health of the other is not to be underestimated. “It’s never too early or too late to start looking after you mouth, your body will thank you.” A healthy mouth enables us to speak, smile and eat. It also promotes self-esteem and enhances our social interactions. A healthy mouth is also a happy mouth. Our mouth in good health is comfortable, smells good and allows us to taste properly. Good oral health is much more than a nice smile. An unhealthy mouth can potentially lead to isolation when people avoid laughing or smiling and interacting with others, as they feel embarrassed about their teeth and mouth. Discomfort may affect our ability to eat what we want, chew happily and chat with others. Oral diseases are also associated with a number of other diseases such as diabetes, cardiovascular disease, respiratory disease and some cancers. A healthy mouth is crucial for maintaining overall health and quality of life. Did you know you can reduce your blood glucose level by 2 points by improving your gum health? This is a staggering difference. Diabetes Type 1 and 2 also affect gum health. Poor, or uncontrolled diabetes creates bleeding and inflamed gums due to the reduction in the body’s ability to fight infection. Did you know cardiovascular disease is linked to poor oral health? Hardening of the arteries is linked to gum disease and the inflammation associated with gum disease. Plaque present within the oral cavity can and does enter the blood stream. These bacteria reach the heart, lodge in damaged areas and cause inflammation. This can result in endocarditis-an infection of the inner lining of the heart. These same bacteria can also lead to increased risk of stroke by causing an elevated C-reactive protein in the blood vessels. What are some warning signs my mouth is unhealthy? Your gums appear red and swollen in some or all of the mouth. Your gums bleed when brushing, flossing or sometimes eating. Your gums are painful or sore to touch. You regularly have “bad breath”, or a bad taste in your mouth. Some of your teeth are loose or some gaps are changing/developing in your mouth. What should I do to take care of my oral health? Regular dental examinations and scale and cleaning with the Dentist or Hygienist are a great way to pick up changes in your oral and general health. Eating a well-balanced diet which includes plenty of fresh produce and drinking a lot of water. The old saying “everything in moderation” is equally applicable to good oral health and good general health. We are very happy to chat to you about any of your concerns. Please make a time with us and enjoy the city vibe buzzing with activity for Mad March. Just beware of the tram works and Adelaide 500 closures along the way. See you in the Clinic!